p class="introtext">Options are growing in number for electronic musicians who want to perform live, and the latest real-time loop manipulation tool, Cycling '74's Radial, promises a new and uniquely intuitive user interface. 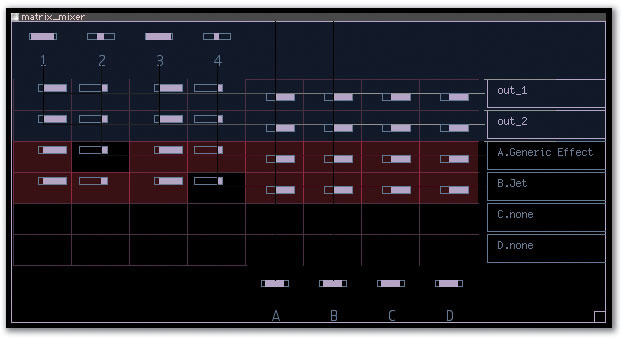 Radial — or, as the box calls it, radiaL — is described by its creators as "loop-based performance software with a beautiful and unique interface thoughtfully optimised for playing live or composing and designing in the moment". 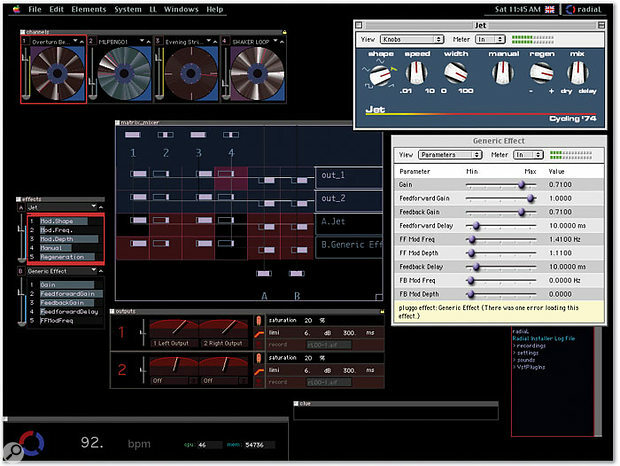 It has been written using the highly-regarded Max/MSP graphical programming environment from Cycling '74 (www.cycling74.com), who are also responsible for bringing it to market. At the time of writing, Radial is available for Mac OS versions 8.6 to 9.2.2. A Mac OS X port is in development, and will be available as a free upgrade to registered users, but no Windows version is currently available. After installation, Radial must be authorised at the Cycling '74 web site, via the familiar challenge-and-response system. Radial will run fully functionally without authorisation for 15 days, but I received my authorisation by email the same day I submitted my request. Cycling '74 will routinely issue two authorisations per user, with further authorisations made available if there's a reasonable explanation for why they're needed (such as because your hard drive died, not because your mate Dave wants a copy). When launched, Radial takes over the whole of your screen, replacing the desktop with its own workspace, which contains several smaller windows. This workspace is black, and most of its windows are similarly dark, with only the most important details picked out in brighter colours. At first, this is slightly disconcerting — but in practice it provides an effective high-contrast display, ideal in the kind of poor lighting conditions likely to be encountered in a live venue. The Channels window offers a number of easy ways to modify the playback of each loop with a click of the mouse. The most important of Radial's windows is the Channels window. By default, this contains four circular elements (any number can be configured), vaguely reminiscent of CD players or turntables, into which sampled loops can be loaded. Loading a sample is as simple as dragging and dropping it from the Files window, which provides a standard browser for searching your hard drive. Other windows include the Outputs window, with its master faders and easy-to-read VU-style meters, an Effects window where VST plug-ins can be loaded, and the Top window, which displays the current tempo along with information about the available memory and current CPU load. The Top window is also home to a circular icon, which rotates when Radial is playing and freezes when it's paused (the space bar toggles pause on and off). Clicking once on this icon causes Radial to retrigger all loaded loops. Before we go on, a few words about Radial's manual. Radial's manual is printed on paper. It's clear and well written. It avoids long words and unnecessary technical details. It tells you how the software works, and what sorts of things you can do with it. In short, Radial's manual is how all software manuals ought to be. If you opt to buy Radial as a download, you'll have to forego the paper manual (and a rather snazzy box as well), but a PDF version is included in any case. All due credit to Cycling '74 for taking the trouble to get the manual right: it makes learning the software a pleasure instead of a headache. The key to getting started with Radial is learning your way around the aforementioned Channels window. When you load a loop into a sample channel, it immediately begins playing at the current tempo. Radial assumes your sample will have been trimmed to a more or less sensible length, such as one or two bars, and automatically pitches it up or down to loop in sync. The Channel Inspector provides many of the functions of a conventional sample editor.Changing Radial's tempo thus changes the samples' pitch, although there are ways to control pitch and time independently, as we'll see. Interestingly, changing Radial's tempo to a negative value (by clicking on it and dragging downwards) causes your loops to play backwards, resulting in some nice turntable-style 'rewind' or 'spin-back' effects. Moreover, Radial's tempo can be set to quite ridiculous extremes (9000bpm anybody? ), to the point where your samples cease to be loops and effectively become wavetable oscillators. Scary stuff. When a loop is playing in a sample channel, a red 'clock hand' travels around the circular display, reflecting the speed at which the sample is being played. 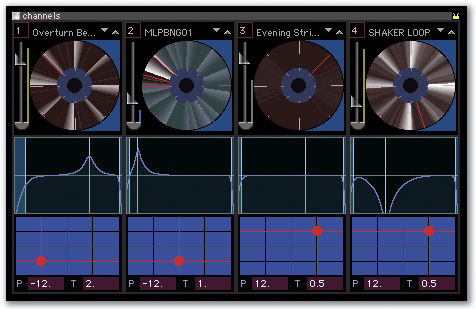 Using the mouse, it's possible to adjust and affect sample playback in a number of ways. Clicking in the centre of the circular display retriggers the loop from the beginning. Clicking and dragging in the middle ring causes a section of the loop to be selected and cycled. By default, one eighth of the loop will be selected initially, with the selection increasing in increments of one eighth as you drag, although it's possible to set Radial to work in larger or smaller increments as required. You can move the start and end points of a selection by clicking in the outer ring. Double-clicking allows you to return to playing the whole loop again. By default, Radial is set up to address two outputs, but more can be configured. 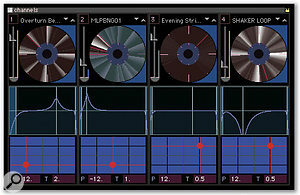 A vertical fader to the left of each channel display controls the level of the channel's output, and clicking and dragging on the small semicircle at the bottom of the fader allows you to control panning as well. Clicking on the small yellow 'lock' icon in the top right-hand corner tells the Channels window to expand and display some other useful controls. Beneath each of the channel displays sit a filter display and a pitch/time grid. The filter display works like a simple, hands-on EQ curve. Using the mouse pointer you can click and drag to create peaks and troughs in the curve. You can add as many peaks or troughs as you like — just keep clicking. Once you've created a suitable curve, you can fine-tune it in various ways. For instance, by clicking and dragging you can adjust the centre frequency of each peak or trough, as well as the filter bandwidth or Q. Each channel also has its own built-in low- and high-pass filters, which can be used to roll off any unwanted low or high frequencies. Double-clicking in the filter window removes all filter settings. Beneath the filters are the pitch/time grids, which can be used to independently adjust the pitch and tempo of your loops, so that all kinds of sampled material can be made to sit together in time and in tune. The grid is fairly self-explanatory. Each step vertically up or down in the grid represents a pitch change of one octave above or below the sample's initial pitch. Each step horizontally to the left or right represents a halving or a doubling of the speed (tempo) at which the loop is played back. You can make smaller changes by dragging on the number boxes below each grid. With subtler settings, pitch and tempo changes sound quite natural. However, Radial allows you to be anything but subtle, and more extreme pitch and time changes can be used to warp loops in any number of interesting ways. It's possible to take two or three loops that just 'don't work' together and simply force them to work... although you may find they end up working in quite unexpected ways. Tremendous fun. Radial supports the ubiquitous VST plug-in standard for effects, and comes complete with 14 fully functional plug-ins, all but one of which are taken from Cycling '74's well-known Pluggo bundle. These include the aptly named Space Echo, the Jet flanger, Generic Effect (a modulatable comb-filter capable of chorusing, flanging and more), Average Injector, the bizarre but fascinating Feedback Network, HF Ring Mod, Filter Taps, Resonation, Resosweep, Chamberverb (a great-sounding and flexible reverb), Limi and Spectral Filter. You're not limited to using Pluggo plug-ins with Radial; any effect adhering to the VST standard should work as well, and every third-party plug-in I tried loaded without a glitch. Whether you're using Pluggo or third-party plug-ins, Radial's effects window allows you to adjust parameters with its own built-in sliders, avoiding the need to clutter your workspace by opening editor windows. A nice feature available when using Pluggo plug-ins is the option to Command-click in the editor window and select a Randomize All option, which automatically assigns a random value to every parameter. This did not seem to work with any of the third-party plug-ins I tried, sadly, so presumably it's a feature unique to Pluggo. It's also worth pointing out that a limiter and a saturation effect are both built-in to Radial's Output window, and can be used not only to prevent clipping in the event of excessive gain, but also to 'warm up' or even distort the program's output. Each loop channel has a small upturned arrow icon in its top right-hand corner. Clicking this opens the Channel Inspector window for the channel in question. The Channel Inspector resembles a conventional sample editor, with a standard linear waveform display. Here you can do a variety of useful things, such as adjusting the start point of a loop, or nudging it very slightly backwards or forwards to aid synchronisation. The Channel Inspector also allows direct access to the 'behind the scenes' mechanics used by Radial to control the tempo and pitch relationships between loops, with numerous options available. Radial's clever Matrix Mixer offers flexible real-time control over levels and effects sends.Briefly, whenever you load a loop, Radial automatically chops it into a number of slices, the number being determined according to its length. By adjusting a couple of parameters called Slice and Xloop, you can alter the number of slices used and the method by which Radial uses them to perform tempo changes and pitch transpositions. Experimenting with these settings allows you to come up with results that sound more natural... or less natural, or just plain different. Another very nice feature worth mentioning here is the Dice button. When activated, this causes the slices in a loop to played in a random order. 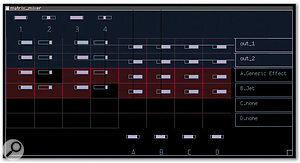 With the slice value set low, this can produce excellent, seemingly never-repeating variations on drum patterns. Higher values, meanwhile, yield mind-bending glitchy noises. Lots of fun either way. Once you've loaded up and tweaked a handful of loops to your heart's content, you'll want to be able to balance their levels, add some effects, and set up a mix. Radial's Matrix Mixer window makes this easy. The Matrix Mixer is fairly self-explanatory: it's a simple grid, with the sample channels along the top (four by default, but remember that any number can be configured), Radial's main outputs (two by default, but more can be configured) in the top right-hand corner, and your effects send/return busses (you guessed it: any number can be configured) arranged below. Clicking and dragging at the point in the grid where a column and a row intersect allows you to control the amount of signal flow between the source and the destination. Shift-clicking allows you to mute or unmute a particular square in the grid, and whole channels can be muted or soloed as required by Shift-clicking or Option-clicking at the top of the relevant column. These shortcuts soon become second nature, and working with the Matrix Mixer is easy. You can record Radial's output to an audio file simply by clicking a Record button in the Outputs window, and the program also offers support for Propellerhead's Rewire and Digidesign's Direct Connect inter-application audio protocols. Additionally, any audio card supporting the ASIO driver standard can be used, and any OMS-compatible MIDI device can send Controller data — for instance, to be able to mute and unmute Radial channels from your keyboard. Finally, Radial can be sync'ed to MIDI clock, to a 'tapped' (mouse-clicked) tempo, and even to an audio signal, provided it contains regular enough peaks for the program to recognise. Whether or not Radial appeals to you will depend entirely on whether you're interested in working with sampled loops and phrases. If you are, chances are you'll already be interested in trying it, and personally, I can't think of a single serious complaint. The fact that Radial loads its loops into RAM, rather than streaming them from disk, makes it rather less suitable for extended laptop DJ sets than, for example, Ableton's Live. However, for real on-the-fly improvisational performances — for "designing in the moment" as Cycling '74 put it — Radial seems to have the edge. In other words, while Live might be a better tool when you already know more or less what set you want to play, Radial is probably preferable when you literally want to make it up as you go along. Radial's ability to utterly transform sampled loops and effortlessly recombine them in dozens of different ways could also make it a useful tool in the studio. If you're struggling with writer's block, or you feel the need to break out of your usual routines and habits, Radial could be a great aid to get you thinking in new ways. Choose four or five sound files at random, start them spinning, and get experimenting. Nine times out of 10, you'll be able find something that grabs your attention. Since a fully functional 15-day demo version is available, you really have nothing to lose by trying it. Take it out for a spin! Easy synchronisation of sampled loops. An original idea, well implemented. RAM-based sample playback may make working with very long audio files impossible. An innovative and original application, which works well and is great fun to use, Radial is more or less unique, and could provide electronic musicians with an entirely new way to approach live performances. It could also serve as a useful compositional and production tool.